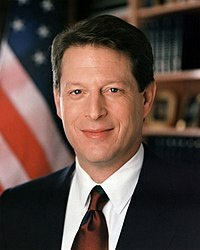 Albert Arnold "Al" Gore, Jr. (born March 31, 1948) is an American politician. He was also the 45th Vice President of the United States. In the 2000 elections, Gore tried to become President of the United States, but lost to George W. Bush. "We Americans write our own history. And the chapters of which we're proudest are the ones where we had the courage to change." Simple: American people make history, by doing important things. The times we are proud of are the times when we were brave enough to change what was happening. "During my service in the United States Congress, I took the initiative in creating the Internet." Simple: When I was still in Congress, I made the decision to create the Internet. "The planet has a fever. If your baby has a fever, you go to the doctor. If the doctor says you need to intervene here, you don't say, 'Well, I read a science fiction novel that told me it's not a problem.' If the crib's on fire, you don't speculate that the baby is flame retardant. You take action." Simple: Earth has a fever. If your baby has a fever, you would go to the doctor. If the doctor says you need to help the baby, you do not say, 'Well, I read a science fiction novel that told me it's not a problem.' If the baby's crib is on fire, you do not say that the baby is fire-proof. You need to do something. ↑ Vice President Al Gore speaks at the Democratic National Convention (August 28, 1996), PBS.org.